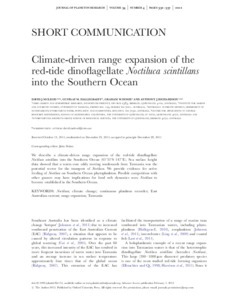 We describe a climate-driven range expansion of the red-tide dinoflagellate Noctiluca scintillans into the Southern Ocean (458310S 1478E). Sea surface height data showed that a warm-core eddy moving southwards from Tasmania was the potential vector for the transport of Noctiluca. We provide evidence for active feeding of Noctiluca on Southern Ocean phytoplankton. Possible competition with other grazers may have implications for food web dynamics were Noctiluca to become established in the Southern Ocean.